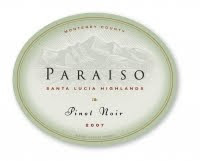 One of the top values in Wine Spectator's 2007 California Pinot Noir report was the 2007 Paraiso Santa Lucia Highlands Pinot Noir. Of the 384 wines they tasted, only 8 earned 90 points or more and carried a release price of $30 or less. The Paraiso retails for $25, so I was ecstatic to receive an E-mail offer from one of my favorite local wine merchants offering the wine at $20. I bought 3 bottles. Over the past month I've had all 3 bottles, but not because I thought the wine so great. Because they were all so different. The first bottle was, for me, entirely over-ripe (and I love big California style wines typically). It went beyond ripe fruit straight to raisins. Not good. The second bottle was dominated by dill aromas. I'm told that dill is commonly imparted by American oak, and in moderate levels I can enjoy dill nuances. But in this bottle it was so overpowering I couldn't notice any thing else about the wine. The third bottle was fine- a very good California Pinot Noir. I'd probably rate it 88 points. After tasting these bottles, I'm left thinking about bottle variation. I don't know of any flaws that lead to over-ripe or exessive dill aromas, so I'm assuming these bottles were all solid. Further, I assume they all came from the same lot (since I bought them at the same time from the same retailer). I'm thinking of 2 people tasting the same wine from different bottles at the same time. Like during TasteLive sessions- 2 people can get entirely different impressions of the same wine at the same time and I typically chalk it up to different palates. Maybe sometimes the wine is significantly different between different bottles? Question of the Day: If you've had this wine, what did you think of it? Either way, what are you thoughts on bottle variation?